I'm thrilled that you have taken a minute to visit my little blog. 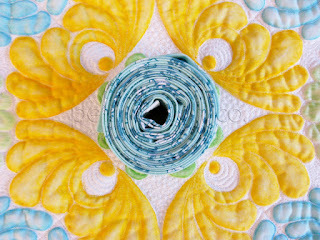 I'm Norma and I love to quilt, sew, cook, take pictures, exercise and blog. Right now I'm running 3 blogs! 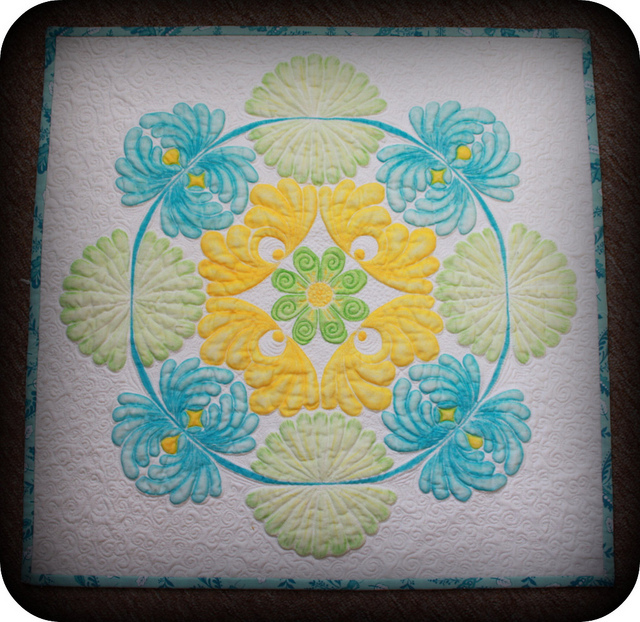 This one, my Quilt Guild blog, and the new Quilty Giveaways blog. Throw a husband, 2 kids and 2 dogs into the mix and I stay pretty busy. Somehow I manage to squeeze in a few quilts here and there. Grab a cup of hot cocoa and stay a while! This year has seemed pretty busy and so my completed quilts have all been on a much smaller scale. I have plenty of large quilts in several stages of completion, but my finishes have all been small quilts for swaps. 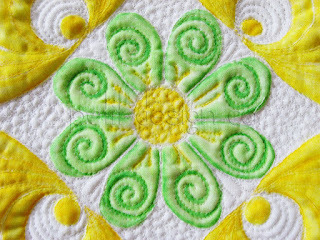 I'm glad I've found online flickr swaps, particularly the Doll Quilt Swap, because these small projects give me a sense of accomplishment. Now before you ask, I'll answer a few questions. - I have a tutorial on color tinting fabric here. - This particular design is by Irena Bluhm, but I discovered color tinting before I knew who she was. - The process pretty much goes like this: 1) Transfer design to quilt top. 2) Do a faux trapunto (somehow I managed to do more work than I had to for this step.) 3) Quilt completely. 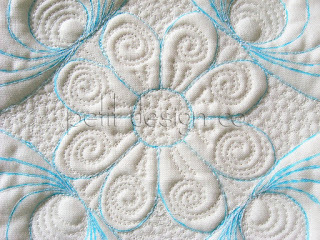 4) Soak quilt top and let dry. 5) Add color. 6) Bind and add label. Click on over to Amy's for more Festival Fun. es fantástico Norma!!! me encanta todo el trabajo que hiciste! That is so beautiful. Fabulous work! So, so beautiful, Norma! Thanks for sharing! Beautiful! I'll be checking out your tutorial on fabric tinting. This is just so beautiful! The colors are rich and I really love that you can tint the fabric yourself. Love it! Amazing how such a small quilt can hold so much beauty. Gorgeous! I like the idea of making small doll-size quilts to try a new technique. Beautiful detail for a flower garden. what a great wholecloth-I was guessing Irena. Hope you send her a picture. Thanks. Beautiful! I love the shading and will be checking this technique out a little more. Thanks for sharing. Beautiful colours and lovely work. Your quilt looks great! It's just beautiful! Excellent work on the colors too! Beautiful work! I've never tried trapunto or tinting but it looks like fun.